Malignant pleural effusions (MPE) are common and associated with disabling symptoms, and large hospitalisation costs . Current management of recurrent MPE is symptomatic, with chest drain and talc pleurodesis, or indwelling pleural catheter (IPC) insertion. IPCs are an increasingly attractive option in patients wishing to avoid hospitalisation as they reduce initial length of stay [2, 3], but require repeated domiciliary drainage. Other patients opt for talc pleurodesis because, if successful, it represents a one-time definitive procedure, but it has a modest failure rate (20–30%) . In the case of talc pleurodesis failure, IPC insertion is usually advocated with the consequence that a subset of patients with IPC in situ will have previously received ipsilateral intrapleural talc. IPCs are also increasingly being used in patients with recurrent benign pleural effusions (non-MPE) [5, 6]. Some patients with IPC will go on to have spontaneous pleurodesis, allowing the IPC to be removed. This occurs in about 40% of patients [7, 8]. Fibrin deposition within the pleural space facilitates IPC-related spontaneous pleurodesis, but it can also induce septations and loculations, impairing effective fluid drainage in patients with symptoms of accumulated fluid. Non-draining symptomatic septated IPC-related pleural effusions (NSSIPE) complicate up to 14% of IPC insertions [8–11]. Non-draining MPEs are associated with higher levels of pleural fluid lactate dehydrogenase and systemic C-reactive protein, indicating an association between non-draining MPEs and increased pleural fluid metabolic activity and systemic inflammation. Septations are thought to arise because of activation of the coagulation cascade, possibly as a result of repeated fluid drainage, the pleural tumour or the IPC itself, resulting in deposition of fibrin and formation of fibrinous strands within the pleural fluid [9, 10, 12], and failure of talc pleurodesis has been associated with increased pleural fibrinolytic activity . Given the larger pleural tumour bulk and greater area of pleural involvement with mesothelioma than with other MPEs , mesothelioma may be associated with increased risk of fibrin deposition. The aim of instilling talc within the pleural space is to induce an inflammatory reaction, leading to fibrosis and adhesion formation between the visceral and parietal pleura. A prior talc pleurodesis attempt in a patient with an IPC may therefore potentially be associated with increased risk of septation formation, and there is therefore clinical uncertainty as to whether IPC insertion should be the treatment of choice for recurrent pleural effusions, rather than talc. This study aimed to assess whether or not prior failed talc pleurodesis is associated with increased risk of NSSIPE. All IPC insertion records (January 2008 to April 2017) were analysed retrospectively. Standard management in our unit during this time was to offer patients with recurrent pleural effusions a choice between 1) chest drain insertion with talc pleurodesis and 2) IPC insertion as first-line management for recurrent pleural effusion (and only after optimising medical management in benign (non-MPE) effusions). Some patients with macroscopic evidence of malignancy at thoracoscopy would have had talc poudrage during the same procedure. In cases of non-expandable lung, patients were not offered the option of talc pleurodesis and IPC insertion was advocated. Data on previous ipsilateral pleural procedures, including attempted talc pleurodesis, and details on IPC outcomes were collected from medical records. NSSIPE was defined as symptomatic pleural fluid collection with septations evident on pleural ultrasound performed by a pleural physician (minimum Royal College of Physicians level 1 thoracic ultrasound competence), in the context of a non-draining patent IPC. IPC-related spontaneous pleurodesis was defined as minimal or no output via a patent IPC, associated with minimal or no residual effusion on chest radiography or ultrasound. There were 202 recorded IPC insertions: non-MPE group (n=21, mean±sd age 70±10.8 years and 29% (n=6) female; underlying causes: hepatic hydrothorax (3% overall), benign pleuritis (3%), heart failure (2%) and other (2.5%)); and MPE group (n=181, mean±sd age 68±13.9 years (p=0.4) and 48% female (n=87) (p=0.09)). There was no statistically significant difference in rates of NSSIPE between IPCs with prior ipsilateral talc pleurodesis (two (2.9%) out of 68 patients,) and those without (six (5.3%) out of 113 patients) (p=0.5, Fisher's exact test), between non-MPE (n=0) and MPE (eight (4.4%) out of 181) (p=0.4), and between mesothelioma MPE (three (7.9%) out of 38) and non-mesothelioma MPE (five (3.5%) out of 143) (p=0.4). The total number of NSSIPEs was eight (4%) out of the 202 recorded IPC insertions. Of these, two (25%) had a heterogeneously septated pleural effusion identified on ultrasound at IPC insertion, and neither had received prior intrapleural talc, while the other six (75%) developed new septation after IPC insertion. Three NSSIPEs were moderate-to-large effusions, and were treated with intrapleural fibrinolytics (two out of two of the patients who had received prior talc, and one out of six of the patients who had not received prior talc). The rest were small effusions and were not treated with intrapleural fibrinolytics. The results are summarised in figure 1. 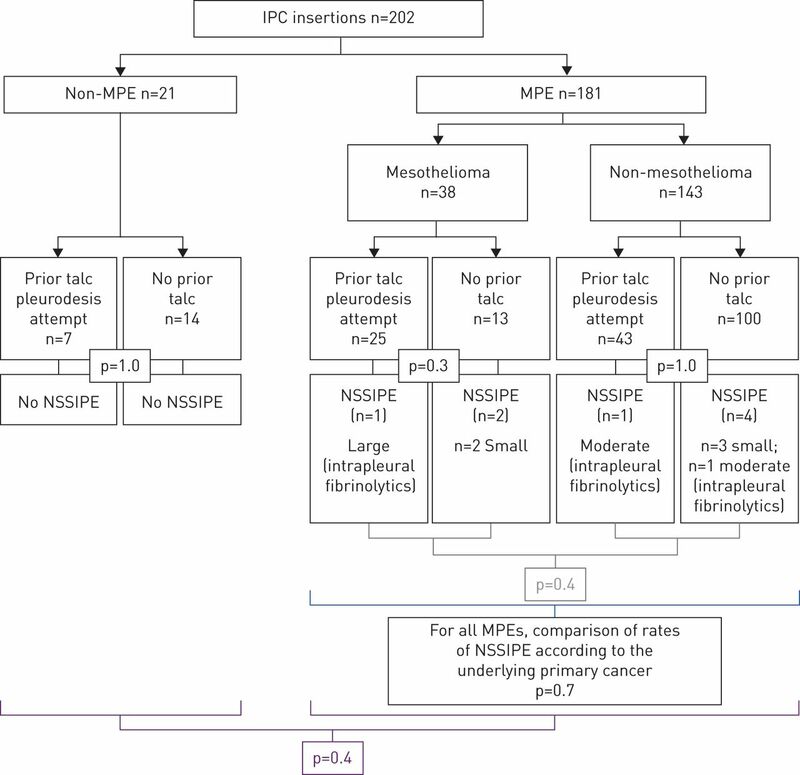 Rate of non-draining symptomatic septated IPC-related pleural effusions (NSSIPE) in patients who had a prior talc pleurodesis attempt and those who had not, and in patients with mesothelioma and non-mesothelioma malignant pleural effusion (MPE). IPC: indwelling pleural catheter. Three IPC insertions (n=1 non-MPE group, n=2 MPE group) were excluded from analysis of spontaneous pleurodesis because of insufficient data on reason and date of IPC removal (n=20 and n=179, respectively, were analysed further). In the non-MPE group, seven (35%) out of 20 had received prior talc once. In the MPE group, 68 (36%) out of 179 had received prior talc (n=60 received talc once and n=8 received talc twice). Overall, 75 (37.7%) out of 199 had received prior talc, and 25 (33.3%) out of 75 achieved spontaneous pleurodesis with a median (interquartile range (IQR)) of 105 (88.5) days to IPC removal, compared with 40 (32.3%) out of 124 spontaneous pleurodeses in IPC insertions without prior talc (p=0.9, Chi-squared=0.02, df=1), with a median (IQR) of 104.5 (87) days to IPC removal (p=0.3, two-tailed Mann–Whitney U-test). Understanding whether or not prior intrapleural talc increases the risk of future NSSIPE or IPC-related spontaneous pleurodesis is helpful in the optimal selection and order of intervention for patients. In this study, there was no difference in rates of NSSIPE between patients who had received prior talc and those who had not, whether they had MPE or non-MPE, and whether the underlying cause for the MPE was mesothelioma or another primary cancer. There was no difference in rate of, or time to, IPC-related spontaneous pleurodesis between patients who had previous failed talc pleurodesis and those who chose IPC in the first instance, whether the patient had MPE or non-MPE. Interestingly, the 4% overall NSSIPE rate in this study population was lower than that quoted in literature (up to 14%) [8–11], and only three (38%) out of eight NSSIPEs were treated with intrapleural fibrinolytics. Non-draining effusions with pleural septation and fibrin deposition are associated with increased pleural metabolic activity and systemic inflammation. The aim of giving talc is to induce an inflammatory response within the pleural space, leading to adhesion formation with subsequent pleurodesis. The results of this study raise interesting questions: in cases of failed talc pleurodesis, why is it that talc is not associated with increased rates of NSSIPE or of subsequent IPC-related spontaneous pleurodesis? It may be that if a patient is unable to mount an adequate initial immune response to talc, and therefore has failure in response to talc pleurodesis, then it is also not possible to mount an adequate immune reaction to talc to form adhesions and septations to develop NSSIPE. Further studies are needed to investigate whether the pleural space in certain patients is inherently resistant to different forms of pleurodesis. This study is limited by the retrospective study design and the relatively small numbers of NSSIPE. The latter is not surprising given that a recent randomised control trial of intrapleural fibrinolytics in non-draining MPEs needed to screen almost 700 patients to randomise 71 non-draining MPEs . However, the small numbers do indicate that a clinician would not commonly encounter NSSIPE, whether the patient has had a prior talc pleurodesis attempt or not. Talc pleurodesis remains an important alternative to IPC insertion in recurrent pleural effusion. The risk of subsequent NSSIPE should not be a reason to dissuade patients from choosing talc as a primary treatment for recurrent pleural effusion, it appears that prior talc pleurodesis does not result in worsened outcomes from subsequent IPC use. Conflict of interest: R. Asciak has nothing to disclose. Conflict of interest: R.M. Mercer has nothing to disclose. Conflict of interest: R.J. Hallifax has nothing to disclose. Conflict of interest: E. Bedawi has nothing to disclose. Conflict of interest: D. McCracken has nothing to disclose. Conflict of interest: N.I. Kanellakis has nothing to disclose. Conflict of interest: J.M. Wrightson has nothing to disclose. Conflict of interest: I. Psallidas has nothing to disclose. Conflict of interest: N.M. Rahman reports he acts as an external consultant to Rocket Medical PLC.
. US hospitalizations for malignant pleural effusions: data from the 2012 national inpatient sample. Chest 2017; 151: 845–854. Effect of an indwelling pleural catheter versus chest tube and talc pleurodesis for relieving dyspnea in patients with malignant pleural effusion: the TIME2 randomized controlled trial. JAMA 2012; 307: 2383–2389. Effect of an indwelling pleural catheter versus talc pleurodesis on hospitalization days in patients with malignant pleural effusion: the AMPLE randomized clinical trial. JAMA 2017; 318: 1903–1912. ERS/EACTS statement on the management of malignant pleural effusions. Eur Respir J 2018; 52: 1800349.
. Indwelling pleural catheters for benign pleural effusions. Curr Respir Care Rep 2014; 3: 61–70. Management of benign pleural effusions using indwelling pleural catheters: a systematic review and meta-analysis. Chest 2017; 151: 626–635.
. Management of septated malignant pleural effusions. Curr Pulmonol Rep 2018; 7: 1–5.
. Complications of indwelling pleural catheter use and their management. BMJ Open Respir Res 2016; 3: e000123.
. Effect of repeated thoracenteses on fluid characteristics, cytokines, and fibrinolytic activity in malignant pleural effusion. Chest 2003; 123: 1188–1195. Pleurodesis outcome in malignant pleural mesothelioma. Thorax 2013; 68: 594–596. Randomized controlled trial of urokinase versus placebo for nondraining malignant pleural effusion. Am J Respir Crit Care Med 2018; 197: 502–508. You are going to email the following Does attempting talc pleurodesis affect subsequent indwelling pleural catheter (IPC)-related non-draining septated pleural effusion and IPC-related spontaneous pleurodesis?